Quarantine and National Theatre Wales are natural bedfellows, two trailblazers in representing their communities as much as the performing arts sector. 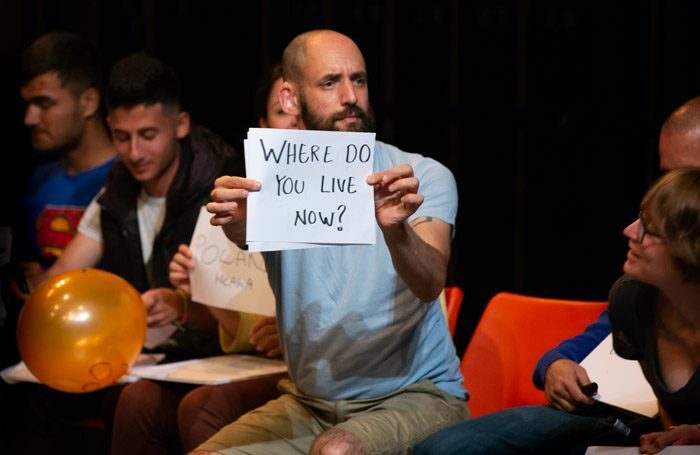 Their new collaborative show English is an encounter more than a play, the audience sat in a large square, engaging in a wider conversation. Words and phrases are looped on a screen from A to Z, prompting conversations on subjects as diverse as apples and de-colonisation. Performer Jonny Cotsen is hugely engaging as our host and performer, and the show comes to life when he’s in full storytelling mode. Cotsen is profoundly deaf and so his relationship with the English language is different to most in the room: an exploration of the word “empathy” was especially moving. Audience engagement is required throughout, however, and, sadly, the conversation occasionally fell flat until Cotsen came to the rescue. Disturbingly, for two companies so committed to community, director Richard Gregory and team ignore its Welsh location. Playing in Wales, the word English has very different connotations than it would in, say, Manchester or London, and no attention is paid to Wales’ bilingualism and own unique culture. In fact, the non-UK citizens in the room would have gone away assuming Wales was a county in England. The choice of words (afternoon tea, cricket, “ee by gum”) reflected only English values, with Welsh and Anglo-Welsh vernacular utterly ignored. This would be irritating were it an English company presenting in Cardiff, but for National Theatre Wales to be seemingly unaware of the nation it represents is unforgivable.